The Nipa hut, Payag, Kamalig or Bahay Kubo, is a type of stilt house indigenous to the cultures of the Philippines. It often serves as an icon of Philippine culture or, more specifically, rural cultures. Its architectural principles gave way to many of Filipino traditional houses and buildings that rose after the pre-colonial era. These includes the Colonial era "Bahay na Bato" which is a noble version of Bahay Kubo with Spanish and some Chinese main architectural influence and has become the dominant urban architecture in the past. And there is also contemporary buildings such as the Coconut Palace, Sto. Niño Shrine, Cultural Center of the Philippines and National Arts Center which are modern edifices that used Bahay kubo as a major influence. The Filipino term Bahay Kubo literally means "cube house," describing the common shape of the dwelling. The term "Nipa Hut," introduced during the Philippines' American colonial era, refers to the nipa or anahaw thatching material often used for the roofs. However, not all Bahay Kubo used Nipa materials, and not all were cube shaped. Nipa huts were the native houses of the indigenous people of the Philippines before the Spaniards arrived. They were designed to endure the climate and environment of the Philippines. These structures were temporary, made from plant materials like bamboo. The accessibility of the materials made it easier to rebuild nipa huts when damaged from a storm or earthquake. They are still used today, especially in rural areas. Different architectural designs are present among the ethnolinguistic groups in the country, although all of them are stilt houses, similar to those found in neighboring countries such as Indonesia, Malaysia, and other countries of Southeast Asia. 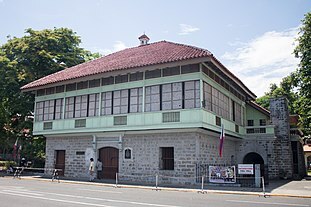 Spanish colonial era Nipa Mansion, a "Proto-Bahay na bato style" house in the Philippines. The advent of the Spanish Colonial era introduced the idea of building more permanent communities with the church and government center as a focal points. This new community setup made construction using heavier, more permanent materials desirable. Some of these materials included bricks, mortar, tiles and stone. Finding European construction styles impractical in local conditions, Spanish and Filipino builders quickly adapted the characteristics of the Bahay Kubo and applied it to Antillean houses locally known as Bahay na Bato/Bahay Luma. Bahay na Bato or Bahay Na Luma is a noble version of Bahay Kubo with Spanish and some Chinese influence. Its design evolved throughout the ages but maintained its nipa hut architectural roots. Its most common appearance is like that of stilt nipa hut that stands on Spanish style stone blocks or bricks as a foundation instead of wood or bamboo stilts. The Bahay na Bato, the colonial Filipino house, followed the nipa hut's arrangements such as open ventilation and elevated apartments. 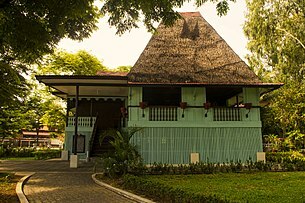 It was popular among the elite or middle class and integrated the characteristics of the nipa hut with the style, culture, and technology of Spanish architecture. The most obvious difference between the two houses would be the materials that was used to build them. The Bahay na Bato was constructed out of brick and stone rather than the traditional bamboo materials. It is a mixture of native Filipino, Spanish and Chinese influences. During the 19th century, wealthy Filipinos built some fine houses, usually with solid stone foundations or brick lower walls, and overhanging, wooden upper story/stories with balustrades Ventanillas and capiz shell sliding windows, and a Chinese tiled roof or sometimes Nipa roof which are today being replaced by galvanized roof. Bahay Na Bato had a rectangular plan that reflected Spanish style integrated with Traditional Philippine style. During the American period of the Philippines, they still incorporated Bahay Na Bato style, though the American Antillean houses are more liberated in design but still keeps the Spanish Colonial designs. Today these houses are more commonly called Ancestral houses, due to most ancestral houses in the Philippines are Bahay na Bato. The rise of nationalistic fervor in light of Philippine independence and the aftermath of World War II led to a movement of architects interested in expressing Filipino culture in modern architecture. Despite the prevalence of the international style in the 1950s, architects such as Francisco Mañosa drew direct inspiration from the bahay kubo in creating what would later be called Philippine neovernacular architecture. The Ifugao houses called Bale were usually similar in architectural designs but they differ in decorative details depending on the tribes. Their houses were harmoniously located with the contour of the Rice Terrace. The one-room house of the Ifugao commonly know to them as fale. The exterior of the house seems to be nothing but a pyramid resting on four posts, while the interior space is enclosed by slanting walls and ceiling that appears to be spherical that are formed by the loft. The Ifugao house is sturdily crafted of timber from amugawan trees raised on four posts, which was buried 50 centimeters below the ground and locked in with stones. The four wooden posts that rest upon the pavement and support two wooden girders, which also supports three wooden transverse joists. The floor joists, floor silts, vertical studs and horizontal beams rests on the post and girders at about head level from a cage. The floor boards were fitted between the joists. The wooden sides of the house slant outward and rise up to the waist, this forms the lower half of the wall. The upper half of the wall is formed by the inner side of the roof. This creates a dark, windowless chamber which suggests a womb. The roof system rests on the "house cage". The steeply pitched pyramidal roof is covered with thick layers of thatch or cogon, insulating the house from the heat of the sun and from the torrential rail. The Torogan is the ancestral houses of the upper-class Maranao in the Lanao Region of Mindanao. It is the dwelling place of the datu along with his wives and children. There could not be any house larger than torogan of the datu within the sultanate, for this signifies rank, prestige and wealth. The Maranaos have three types of houses: lawig (small houses), mala-a-walai (large houses), and the torogan. The existing torogans were built by the community and the slaves for the datu in 1800s. This house of the datu has no partitions. It is a multifamily dwelling where all the wives and the children of the datu lived. The windows of torogan are slits and richly framed in wood panels with okir designs in front of the house. The communal kitchen is half a meter lower than the main house is used for cooking and eating. The distinct high gable roof of the torogan, thin at the apex and gracefully flaring out to the eaves, sits on a huge structures enclosed by slabs of timber and lifted more than two meters above the ground by a huge trunk of a tree that was set on a rock. The end floor beams lengthen as panolongs the seemed to lift up the whole house. The torogan is suffused with decorations. There were diongal at the apex of the roof, an intricately carved tinai a walai, okir designs in the floor, on windows and on panolongs. There were brightly colored weaves or malongs hanging from the rafters, using ropes around a particular territory for privacy. The house was built to sway during earthquakes. Twenty-five posts of huge tree trunks were not buried but are freestanding. Sometimes, if needed, wooden pegs were used to secure the wood members. These were used to prevent the house from collapsing. In the Sulu archipelago, native houses are diverse. The stilt houses of the Tausug people are adapted to a coastal lifestyle. Traditional Tausug stilt houses have recognizable "horns" on the roof, the only architectural style in the country to possess such a roof style. Inland Tausug architecture is similar, but have bases similar to the bahay kubo. The Bajau people, and other nomadic sea gypsies in the Sulu archipelago, are known for their boat house architecture. They live in boats with roofs, fashioned as both transportation and permanent home. This way, the Bajau would no longer re-establish a home while they traverse the numerous islands and fishing grounds of Sulu. The Yakan of Basilan also have a distinct architecture. Their houses have been influenced by the Tausug, Bajau, and traders from pre-colonial Butuan and Champa (present-day central Vietnam). Palace of Flowers was the royal palace of the Sultan of Sulu since historical times. Theories suggest, based on the appearance and status of Daru Jambangan, that other pre-colonial palaces in other parts of the once divided pre-colonial Philippines might have the same look except for a few cultural and individual differences. Rizal Shrine (Dapitan) is a collection of five houses of bamboo and nipa originally built by José Rizal. It shows different styles that could emerge from Nipa Hut architecture. One of the most famous is Casa Redonda: An octagonal stilt house that served as the quarters of Rizal's students and a clinic. Century old Bahay kubo with high stilts. Although there is no strict definition of the Bahay Kubo and styles of construction vary throughout the Philippine archipelago, It is originally and is still typical today for Bahay kubo to be mostly organic in material and be elevated, mainly for Vernacular and Superstitious reasons and because of floods during wet season and the hot dry land during summer can cause a lot of problems for the inhabitants. Similar conditions in Philippine lowland areas have led to characteristics "typical" of examples of Bahay Kubo. These houses are mostly stereotyped today as being small and poor, mainly because modern contemporary Nipa hut mostly possesses these characteristics. But many are in fact big and can be considered "mansions". Examples of these are the Bahay na bato houses, which are often mistaken to being another type of house when in reality Bahay na bato are still considered a type of "Bahay kubo". Another example is the old vernacular mosques in the Philippines called "Langgal". Another are the Pre-colonial Royal palaces described by European explorers as being large in proportion which is evident in recorded palaces like the Daru Jambangan of Sulu and the Torogan royal houses of Maranao. With few exceptions arising only in modern times, most Bahay Kubo are on stilts: the living area is accessed by ladder. This naturally divides the house into three areas: the living area in the middle, the area beneath it (referred to in Tagalog as the silong), and the roof space (bubungan), which may or may not be separated from the living area by a ceiling (kisame). The traditional roof shape of the Bahay Kubo is tall and steeply pitched, ending in long leaves. A tall roof creates space above the living area through which warm air could rise, giving the Bahay Kubo a natural cooling effect even during the hot summer season. The steep pitch allows water to flow down quickly at the height of the monsoon season while the long eaves give people a limited space to move about around the house's exterior when it rains. The steep pitch of the roofs are often used to explain why many Bahay Kubo survived the ash fall from the Mt. Pinatubo eruption, when more ’modern’ houses collapsed from the weight of the ash. Raised up on hardwood stilts which serve as the main posts of the house, Bahay Kubo have a silong (the Tagalog word also means "shadow") area under the living space for a number of reasons, the most important of which are to create a buffer area for rising waters during floods and to prevent pests such as rats from getting up to the living area. This section of the house is often used for storage, and sometimes for raising farm animals, and thus may or may not be fenced off. The main living area is designed to let in as much fresh air and natural light as possible. Smaller Bahay Kubo will often have bamboo slat floors which allow cool air to flow into the living space from the silong below (in which case the silong is not usually used for items which produce strong smells) A Bahay Kubo may be built without a kisame (ceiling) so that hot air can rise straight into the large area just beneath the roof and out through strategically placed vents. The walls are always of light material such as wood, bamboo rods, or bamboo mats called "sawali." As such, they tend to let some coolness flow naturally through them during hot times and keep warmth in during the cold wet season. The cube shape distinctive of the Bahay Kubo arises from the fact that it is easiest to pre-build the walls and then attach them to the wooden stilt-posts that serve as the corners of the house. The construction of a Bahay Kubo is therefore usually modular, with the wooden stilts established first, a floor frame built next, then wall frames, and finally, the roof. Bahay kubo are typically built with large windows, to let in more air and natural light. The most traditional are large awning windows, held open by a wooden rod. Sliding windows are also common, made either with plain wood or with wooden Capiz shell frames which allow some light to enter the living area even with the windows closed. In more recent decades inexpensive jalousie windows became common. In larger examples, the large upper windows may be augmented with smaller windows called ventanillas (Spanish for "little window") underneath, which can be opened for ventilation to let in additional air on especially hot days. Some Bahay Kubo, especially those built for long-term residences, feature a batalan ("wet area") distinct from other sections of the house — usually jutting out somewhat from one of the walls. Sometimes at the same level as the living area and sometimes at ground level, the batalan can contain any combination of cooking and dishwashing area, bathing area and, in some cases, a lavatory. The walls of the living area are made of light materials. Posts, walls, and floors are typically made of wood or bamboo and other light materials. The thatched roof is often made of nipa, anahaw or some other locally plentiful plant. Thus, making it easier for the nipa huts to be moved if needed. A nipa hut is an icon of Philippine culture as it represents the Filipino value of bayanihan, which refers to a spirit of communal unity or effort to achieve an objective. Community members practicing "bayanihan", working together to move a house to new location. sibuyas, kamatis, bawang at luya. It is a very cultural but misleading song as not all Bahay kubo are small and surrounded by vegetables. Some early and original variants are even palace or mansion like and used by native royalties or in the colonial era used by Captains and governors. Some original mosque and churches in the Philippines are even in Nipa hut style. ^ a b c d e f g Caruncho, Eric S. (2012-05-15). "Green by Design: Sustainable Living through Filipino Architecture". Philippine Daily Inquirer. Makati, Philippines: Philippine Daily Inquirer, Inc. Retrieved 2013-10-16. ^ a b c d e f Cruz, Rachelle (2013-08-23). "THE BAYANIHAN: Art Installation at Daniel Spectrum". The Philippine Reporter. Toronto, Ontario, Canada. Retrieved 2013-10-16. ^ a b Kim, Young-Hoon (2013). "A Study on the Vernacular Architecture in Bahay na Bato, Spanish Colonial Style in Philippines". KIEAE Journal. 13: 135–144 – via Korea Institute of Science and Technology Information. ^ a b c Stott, Philip. "Republic of the Philippines". Oxford Art Online. Retrieved 2017-05-25. ^ a b Kim, Young Hoon (2013). "A Study on the Spatial Composition influenced by climatic conditions in 19C Bahay na Bato around Cebu city in Philippines". KIEAE Journal: 29–37 – via Korea Institute of Science and Technology Information. ^ Caruncho, Eric S. (2017-02-15). "Mañosa at National Museum: The Filipino artist who should have been National Artist". Retrieved 2018-10-24. ^ "Rizal Shrine Dapitan". National Historical Commission. Retrieved 9 November 2014. ^ a b Alojado, Jennibeth Montejo. "From Nipa Hut to House of Stone". philippine-islands.ph. Alojado Publishing International. Archived from the original on 2012-08-08. Retrieved 2013-10-16. ^ "Bahay Kubo (Philippine Kids Song)". Mama Lisa's World. Retrieved 23 July 2015. Wikimedia Commons has media related to Nipa huts.